Since it’s opening in 1946, Holiday World in Santa Clause, Indiana has grown to become a power house in the theme park world. When the park originally made its debut, it claimed the title as the first theme park in the world. It began as just a small getaway where families could have fun riding the few attractions. Now, Holiday World has expanded into a full time resort, with a world class theme park, Holiday World, as well as an award winning water park, Splashin’ Safari. Back in 1995, the park introduced, Raven, a Custom Coasters International creation that curved with the forest not against it. The coaster instantly became a hit recieving numerous awards and plenty of praise. Continuing the craze, the park added the Legend in 2000. Another creation by Custom Coasters Inc, yet again the park did not disapoint. And in recent years, the park has added Pilgrim’s Plunge, a revolutionary water ride, Zinga, a massive ProSlide Tornado, and the Voyage, the world’s number 1 wooden coaster. 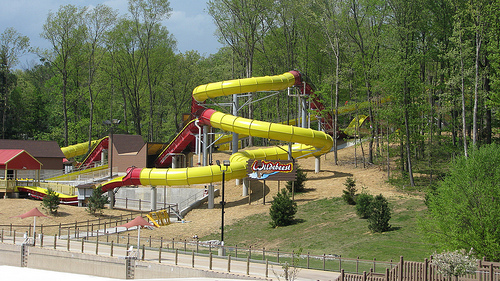 2010 marks the arrival of Wildebeest, the world’s longest water coaster. Wildebeest hurdles riders up and over numerous hills through magnetic technology. Riders get a roller coaster like experience on a water slide. Also new for 2010 will be new Timberliner trains, made by the Gravity Group for the Voyage. These new trains will create a much smoother voyage, for riders. 1. At what point in time did the park start considering the addition of Wildebeest? And for that matter, how far in advance does the park look for future additions? Oh, we’ve been thinking about adding a water coaster for years. We studied all the different types, looking for the most exciting model with the highest capacity. We found that with Wildebeest. 2. What prompted the decision to replace the original PTC trains with the new Gravity Group Timberliner trains on the Voyage? Since The Gravity Group designed these trains with The Voyage in mind, we were of course intrigued. TGG tested their prototype on The Raven a year ago and we truly liked what we saw. We thrilled to be able to have the first set. 3. Holiday World has some of the best wooden coasters in the world, the Raven, the Voyage, and the Legend. Have you ever considered a major steel coaster? Oh, we’re always talking … some folks post that they “know” we’ll never add a steelie. I wonder where they got that? 4. Can we expect to see the addition of unique, record breaking attractions as a continuing trend at Holiday World and Splashin’ Safari? Well, not *every* season, but we definitely like to shake things up a bit. Sometimes just adding a bit of height or length can make the ride a record breaker. What’s not to love about that? We would like to thank Paula and the rest of Holiday World and Splashin’ Safari for taking the time to answer our questions. We hope you enjoyed it. Leave a comment with your Park Thoughts below. The Countdown to World of Color has begun! Ladies and gentlement, boys and girls, after much anticipation and lots of excitement, the days are beginning to tick down as we approach the grand opening of Walt Disney’s Wonderful World of Color! Located at Disney’s California Adventure, this nighttime spectacular will be the most advanced, high tech, and massive water show ever produced. With over 600+ water fountains each made to bring classic Disney movies to life and at a cost of +100 million dollars World of Color is sure to be the biggest addition of 2010. The countdown has begun to World of Color’s grand opening on June 11, 2010. The Kentucky Derby is an American classic: the thrill of horses racing through down the mighty dirt track, jockeys straddling the great steeds as the speed inches away from disaster. However, the Kentucky Derby is a joy that only a lucky few get to experience first hand. 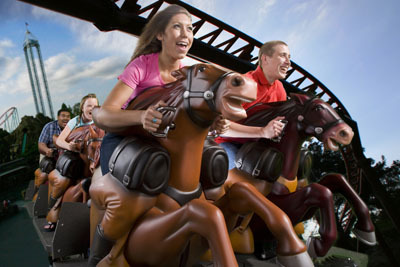 However, at Knott’s Berry Farm, park goers can get an idea of how it feels to race a mustang on Pony Express, a Zamplera Moto-Coaster with horse themed trains. Opened in the spring of 2008, Pony Express was targeted towards a younger audience. With a relatively gentle 38 mph launch, this thorough breed coaster is quite tame. The slower speeds and lower heights certainly don’t make it the holy grail for thrill seekers but at just a 48-inch height limit, Pony Express is something the entire family can enjoy. Personally, I enjoy Pony Express. Not exactly a ride worth dying over if you miss it, but still a solid, enjoyable ride. Once aboard the train, the unique and controversial harness goes into action. A metal bar locks rider’s legs into place. While that happens, a cushioned harness rises from beneath the horse shaped train to push against the rider’s back locking them in place. Between the two restraints, riders are forced into a straddling position. Depending on guests’ body type and shape, the position can be extremely comfortable or uncomfortable – I find it to be manageable. Usually, this is the threshold which pushes guests to either side of the fence: enjoying or loathing the experience. After leaving, the train makes a long pause at the launch track before accelerating from 0 to 38 mph in 3 seconds. Horses climb up and over the 44 foot high turn-around before gliding back down just over the railroad track. Once again, riders find them selves cresting a small hill before diving past the station where the on-ride photo point is located. The rests of the journey consists of banked turns over Big Foot Rapids, an enclosed turn around and one more bunny hop. Finally, riders come to a very slow and long stop on the break run. At this point, at least every child has a smile on their face. So what can we learn about Pony Express from this review? Ride it yourself and make your own decision. Pony Express gets mixed reviews and this is just one opinion among a thousand others. I give Pony Express a 6.5/10 – a coaster worth testing out yourself. But then again, those are just my Park Thoughts.